And so we jumped into our car and headed to Lambertville to pay Brian a visit. 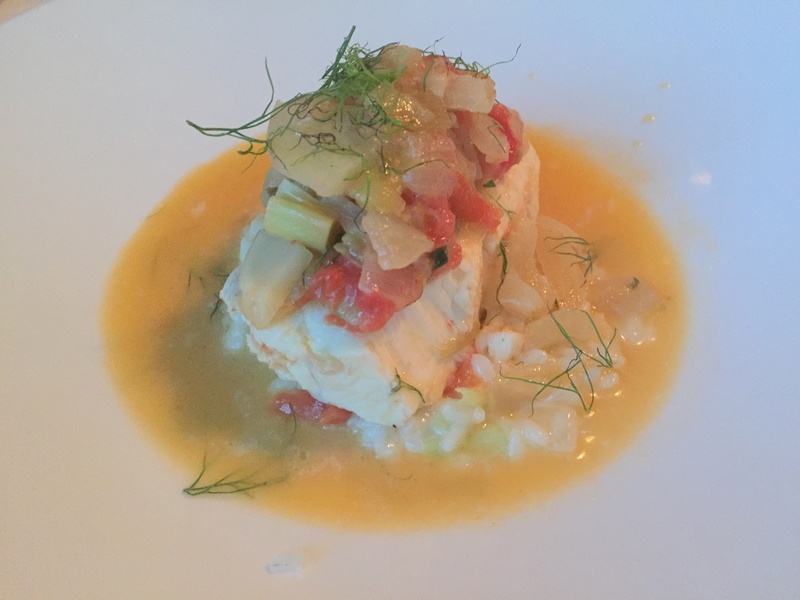 I’ve written glowingly about chef’s tasting menus and various great culinary experiences we’ve had when we released our inhibitions and let the chef deliver whatever they want. So when Brian asked us if we wanted to order off the standard menu or perhaps try something different, I immediately requested a tasting. Before I barrage you with many words, let me state this simply: this may well have been the most delicious meal I’ve had in years. From the dinner roll to the dessert, everything we had was flavorful and perfectly prepared. 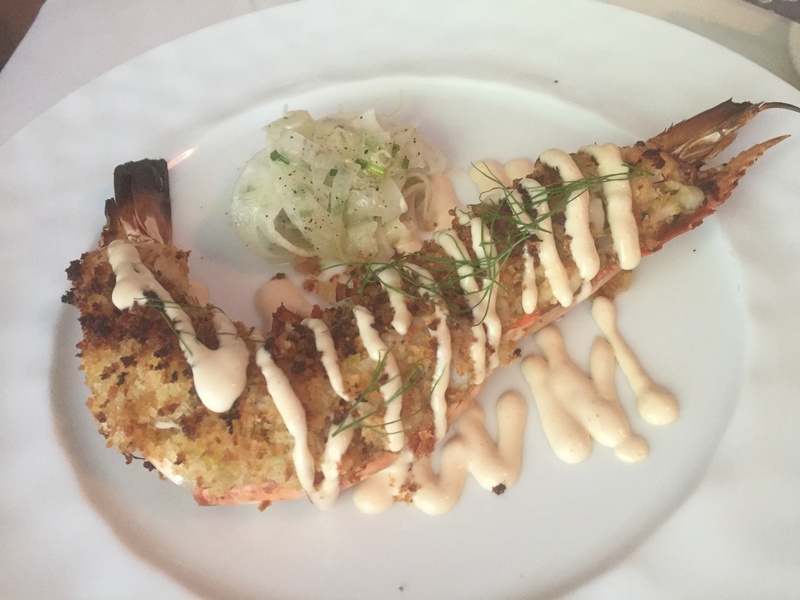 Our first “real” course was a colossal shrimp stuffed with crabmeat and drizzled with a garlic aioli. This was indeed a colossal shrimp! I swear this was a lobster, not a shrimp. It was *HUGE*! From the first taste, I knew the meal was going to be fabulous. The slightly crispy topping and aioli were a perfect complement to the subtle shrimp and crab flavors held within. I slowly savored every morsel all the while looking in wonder at this beastly shrimp. I don’t know how Brian makes this potato concoction but it was crispy, salty and yummy. Below it lies tender chunks of lobster meat in a citrus sauce. The resulting unique combination of flavors and textures created a real tongue-teaser that Evy and I both enjoyed, wishing that we had something to soak up every last drop of sauce. 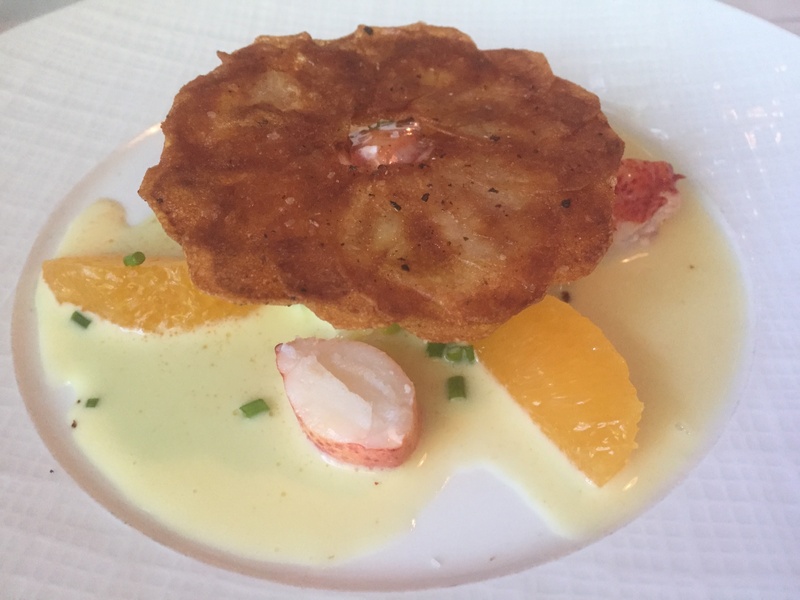 The lobster was followed by goat-cheese ravioli in a fresh tomato sauce. 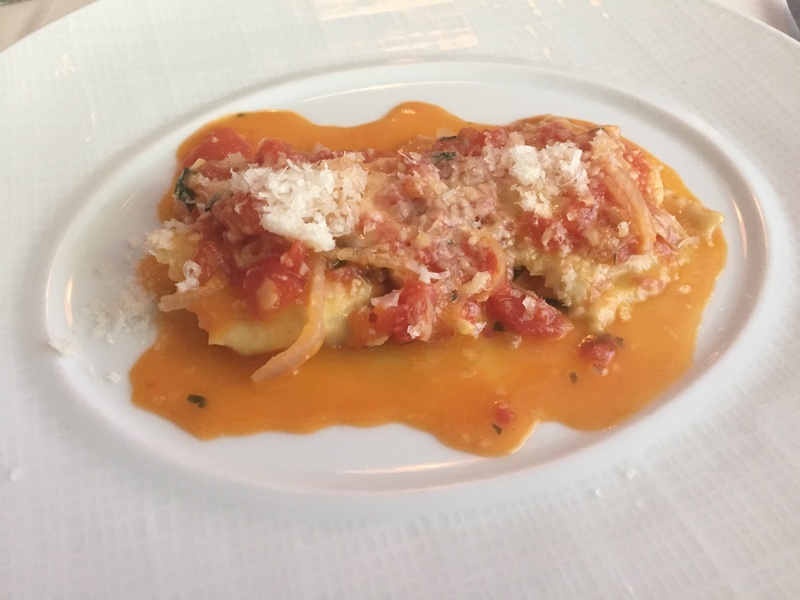 If you read last week’s post about NoLa, you’ll remember that I really liked Brian’s ravioli. So we were excited when this appeared. Evy, who usually doesn’t care for stuffed pasta, declared “this is the best ravioli I’ve ever had. If all ravioli were this good, I’d eat it all the time!” My photo doesn’t do it justice (apologies to the chef). This is not the ravioli you’re used to having. Thin pasta filled with tangy goat cheese topped with a simple sauce. I imagine that this is the type of pasta dish that caused diners to fall in love with Italian food in the first place. It’s truly hard to beat. 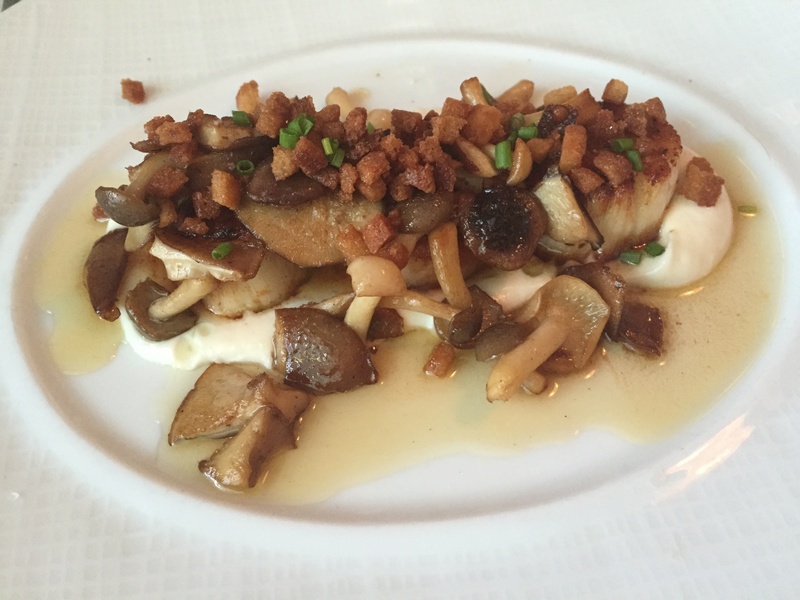 Evy, who had requested seafood dishes, got sea scallops with wild mushrooms and flavored with white truffles. I probably don’t need to say more. Imagine those ingredients layered together. It’s a wonder Evy let me try any at all, but sweetheart that she is, she allowed me one forkful of this magnificent dish. Yes, the same dish that the NYT reporter recalled as they drove to Brian’s on a cold and rainy night. And you know what? I would gladly drive out on a stormy night to get this again. Sweetbreads have a bad reputation. I think we’ve been trained to think that there’s something gross about them. But you know what? If we’re eating meat, why not honor the entire animal by enjoying every bit of it? And did I ever enjoy it! Forget your preconceptions, just try this next time you’re in the area. It’s tender on the inside, perfectly crispy on the outside, and utterly delicious. 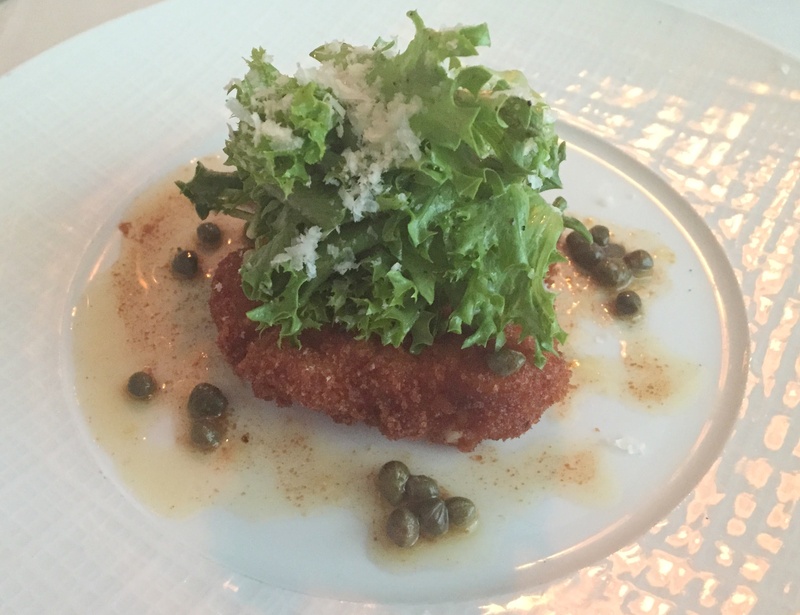 The trouble is, I don’t think I’ll enjoy other sweetbreads because this one was so perfectly executed. At this point I was worried that dessert was going to show up. But it didn’t. Instead, out came the main course. I can’t believe we were able to eat it, but eat it we did! I would normally describe it here, but I was so distracted by my Blanquette du Veau (veal in cream sauce), that I forgot to make notes. 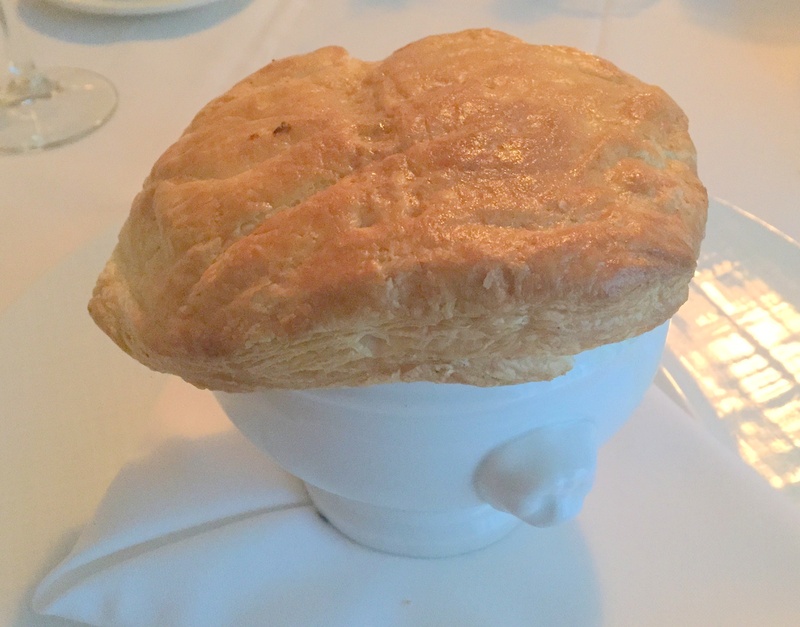 Now *this* is a pot pie! You may recall that I write a lot about the classes I’m taking at The Farm Cooking School in Stockton. Currently, I’m taking their French cooking series. Coincidentally, last week we made a version of Blanquette du Veau. I thought it was quite possibly the single best dish I’ve made there. So it was exciting to be trying Brian’s version of this classic dish. Topped by a flakey puff pastry and hidden inside this container, was pure bliss. Fork-soft chunks of veal in a incredible butter-cream sauce. It’s the type of dish that you’d want to eat every day but you don’t because your heart would cease to be able to pump your cream soaked blood. But if you’re looking for a treat for a special occasion, this is the dish. And how did it compare with what we made in cooking class? Let me just say that I think I’ll have to practice this dish for years before coming close to attaining Brian’s level for this dish. I truly consider myself lucky to have been able to eat this dish. Last meal request? This is it. My final course was bread pudding with a liquor-butter sauce. As if I hadn’t had a decadent enough night! Have you ever been to New Orleans? If so, you’ve likely had their famous bread pudding. 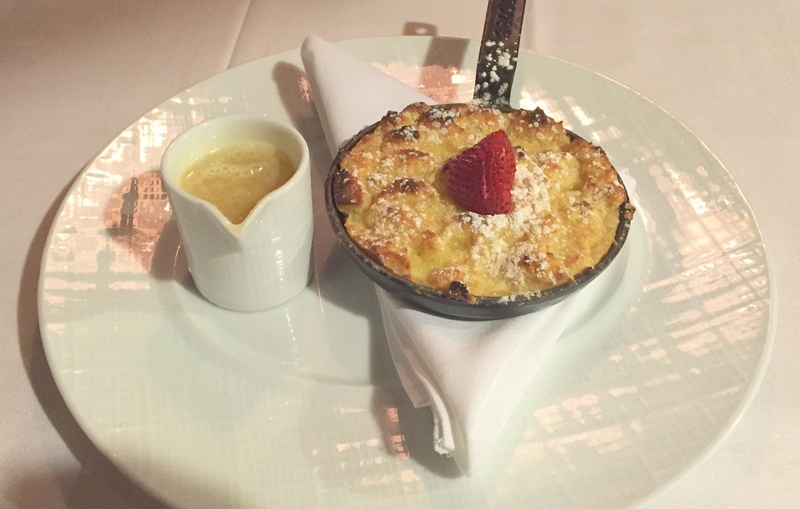 Without exaggeration, N’awlins bread pudding likely has at least a stick of butter in every bowl. it’s served in a soup bowl, with a chunk of bread pudding maybe 2″ on a side, surrounded by a sea of butter-rum sauce. It’s disgustingly rich, but it has to be tried at least once in every lifetime. Well, Brian’s has the buttery aromas and rich flavors of the New Orleans original without the pool of butter. Don’t get me wrong, that little pitcher is filled with a butter sauce, but you don’t have to pour it all over the bread pudding. With a bit of self control, you can just drizzle enough over the pudding to impart the flavors, without taking several years off your life.